Neurons are highly specialized cells that have accentuated the basic characteristics of other cells, which include transmembrane potential, the ability to form extensions of its cytoplasm, and so on. The extensions of neurons have also become specialized, so that the ion channels and receptors in dendrite membranes are different from those in axon membranes. In addition, every neuron has its own unique shape, its own unique position in the nervous system, and its own unique connections to other neurons or to receptor (sensory) cells or effector (muscle or gland) cells. This great variability (there are over 200 different kinds of neurons) means that some neurons deviate from the standard basic morphology. 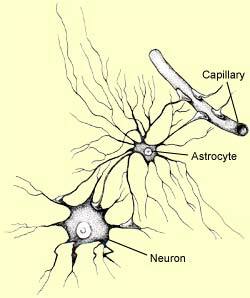 For example, some axons may form synapses directly with another neuron’s cell body, or even with its axon. Neuronal cell bodies also vary widely both in size (small, medium, large, and giant) and in shape (star-shaped, fusiform, conical, polyhedral, spherical, pyramidal). 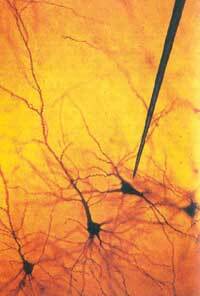 The geometry of a neuron’s dendrites and axon also vary tremdously with its role in the neural circuit. Astrocytes, like most glial cells, were long considered essential for their role in supporting and maintaining nerve tissue. But more and more evidence indicates that astrocytes may actually play a far more important role in neural communication. For instance, it has long been known that astrocytes supply glucose needed for nerve activity. Through the astrocytes’ end feet, which are apposed to the walls of the capillaries in the brain, glucose can enter the astrocytes, which partially metabolize it, then send it on to the neurons. More intense synaptic activity, it even seems, promotes a better supply of glucose by activating this astrocytic metabolisis. It is also known that astrocytes are connected with each other via “gap junctions” through which they can pass various metabolites. It is through these junctions that astrocytes evacuate to the capillaries the excess extracellular potassium generated by intense neuronal activity. But what is being discovered more and more is that this network of intercommunicating astrocytes forms a veritable syncytium–in other words, it behaves like a single, unitary entity. For example, through this network, the regulatory effects of waves of calcium ions might be propagated to large numbers of synapses simultaneously. The astrocytic extensions surrounding the synapses might thus exert a broader control over the concentration of ions and the volume of water in the synaptic gaps. The network of astrocytes would thus constitute a non-synaptic transmission system superimposed on the neuronal system to play a major role in modulating neuronal activities.